And here’s the proof. 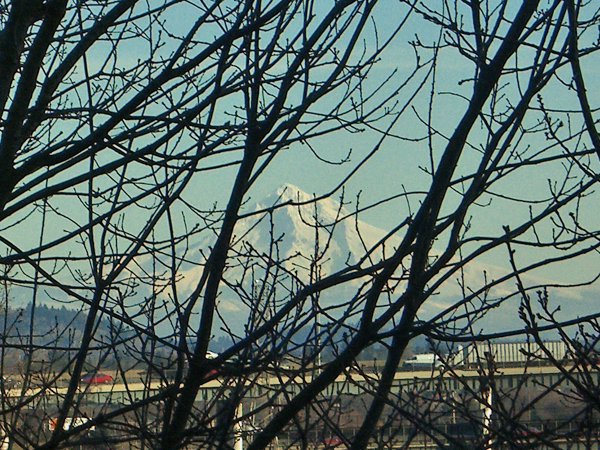 Mt Hood from my window at work. It’s not easy to see it through the bare branches of the trees. But with the leaves gone I at least have a chance. In the summer, I can’t see it at all. Click on the pic to see a bigger version in a pop-up. I knit about 6″ on Sock Scarf Two last night at Tangle knit night. Since I’m knitting both “socks” at the same time, that translates in to almost 12″ of actual scarf length. I think that about 2 or 3 more stripe repeats should do it. If I get myself in gear, I should be able to do that tonight. I need to get in gear in more than one area!